May and June are always exciting months for students who are graduating! I decided that these cupcakes would be the perfect addition to a graduation celebration. Aren't these little diplomas so cute?! 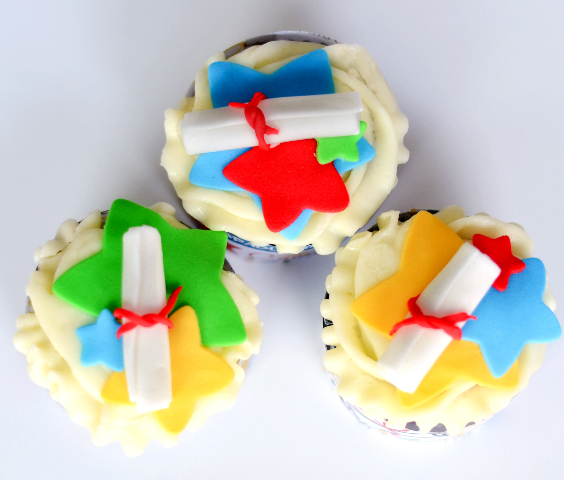 The stars and diplomas are made out of fondant... but don't get scared! All you have to do is cut them out and place them on! I show you the exact way to do it in this video. You can even use your school colors to customize the look! Happy Tuesday! And congratulations to all of you who are graduating :) I sure can't wait for that day to arrive! Next Tuesday: Memorial Day Celebration cupcakes! Loved your blog Brooke! I look forward to them each week! Thank you! I'm so glad you like them!! Just found your blog, and it's adorable! I always try to make "special" 3D character cakes for my boys' birthdays, but I will admit that I am all self-taught and primitive when it comes to cake decorating (think plastic baggies with the corners snipped off for piping). Your tutorials will help so much! Thanks! I'm so glad :) If you make anything from my tutorials send me a picture and I would love to feature it in a post! Am I blind or are the instructions for the graduation cupcakes not available to print? I like things written down to look at. Not a huge fan of having to watch video tutorials.